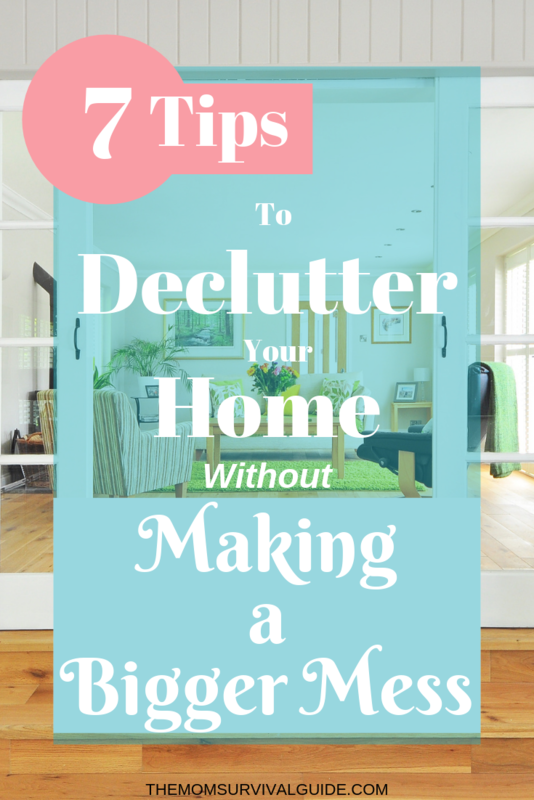 7 Tips To Declutter Your Home Without Making a Bigger Mess! 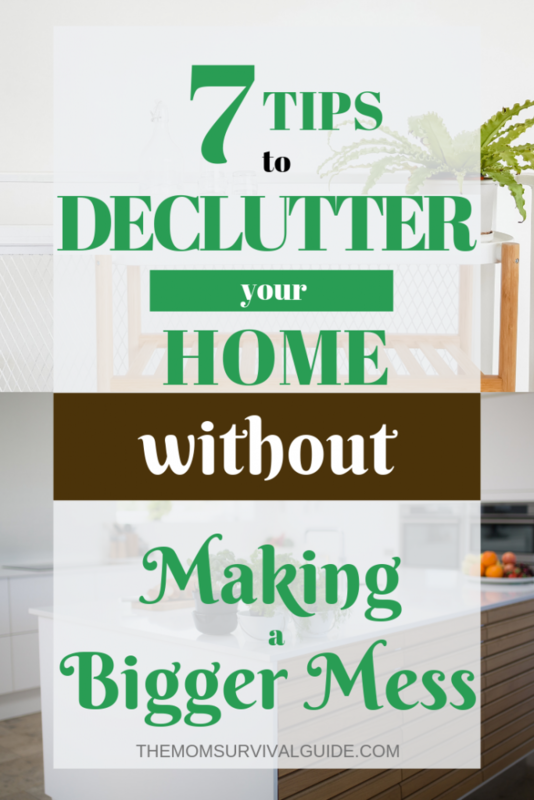 Do you have a space in your home that really needs to be decluttered, but you are not sure how to weed through the mess without making a bigger mess? I am just going to be blunt here. 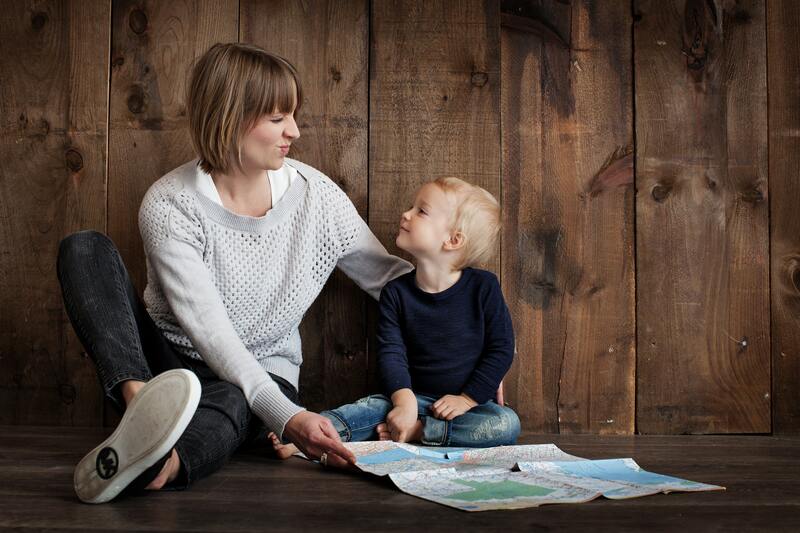 If you are trying to organize and declutter your house and are making a bigger mess in the process, then you are not effectively organizing and decluttering. Let me phrase that a little nicer. I know you have good intentions. Getting organized and trying to declutter is awesome and taking the steps to do it is great! But purging everything all at once will make you crazy and give you serious burnout before you make it through the whole project. When you purge, you must purge with purpose! 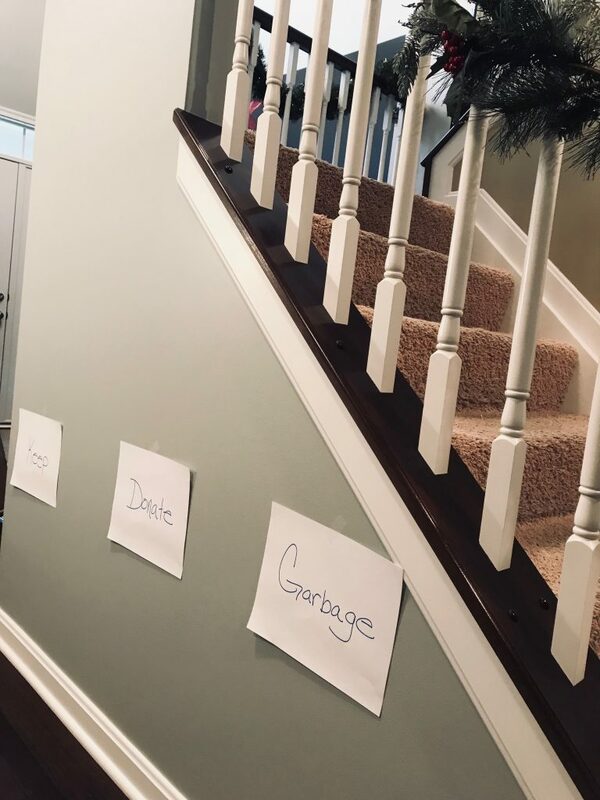 Which I talk about in my 5 Steps to Organize Any Area Of Your Home post, but will go into more detail about the process here. 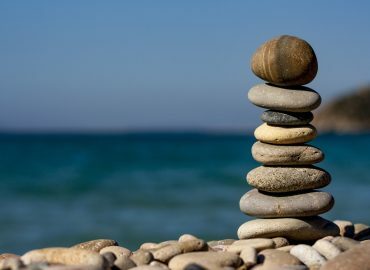 The point of getting organized is to make your life less stressful, less chaotic, and give you more time in your life. 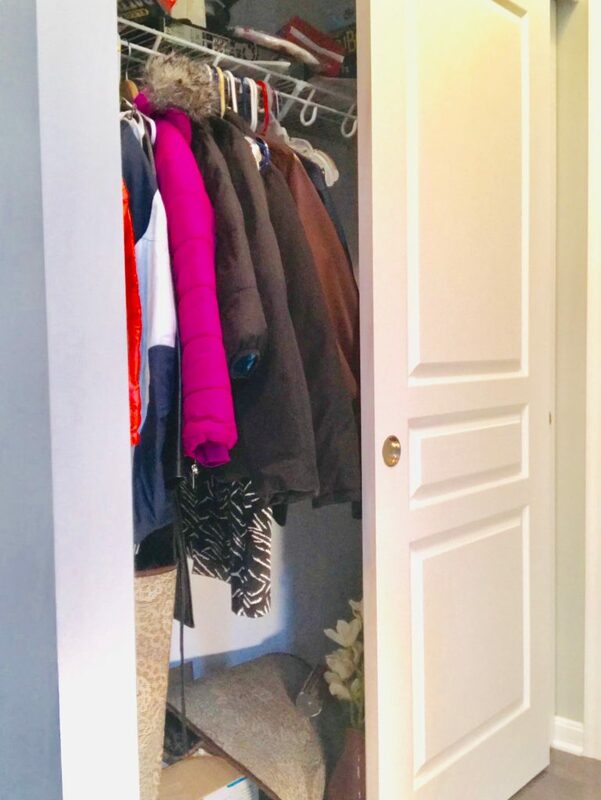 So if you decided to just pull everything out of that closet that you have been stocking with all kinds of random STUFF for the last 12 years, then that is soooo not going to help you. There are so many organizational sites out there telling you to just take everything out of a space. “Pull it all out so you can see what you have!” is what they all say. Well, I am here to tell you that it…DOES NOT WORK! Let’s just think about this for a minute. We just restated the purpose of organizing (less stress, chaos, and time drains)! 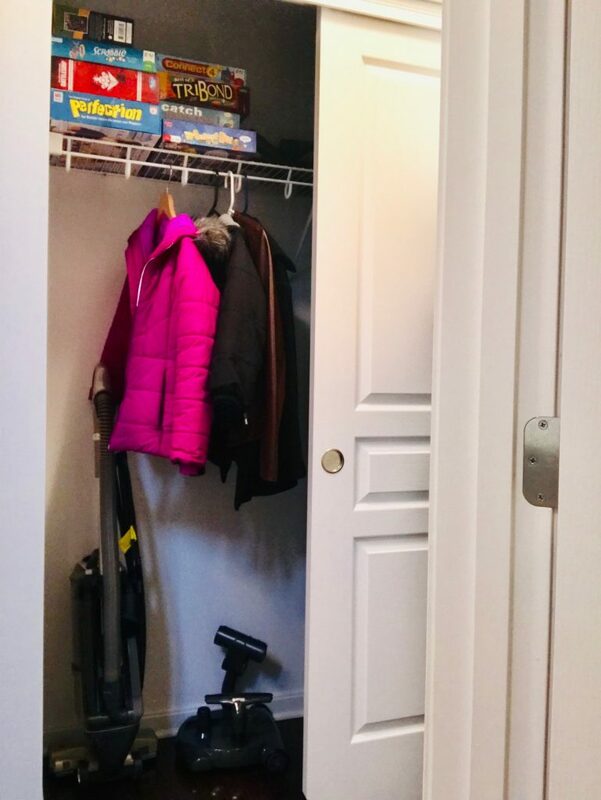 So how does pulling everything out of the concealed junk closet help you? It is hidden there. Nobody has to see it…including you! Now, if you have removed EVERYTHING! All your junk is out in the open. To cause you way more stress every time you look at it! For you and the rest of your family to trip over! And the biggest problem…(add scary sounding music here) what if you don’t finish?! AAAAAAHHHHHHHHHH! What if you actually don’t have enough time to put that big old mess away! Not only is there now clutter all over your house, but you may not have time to get back to it for another few days!!!! TALK ABOUT STRESSFUL! 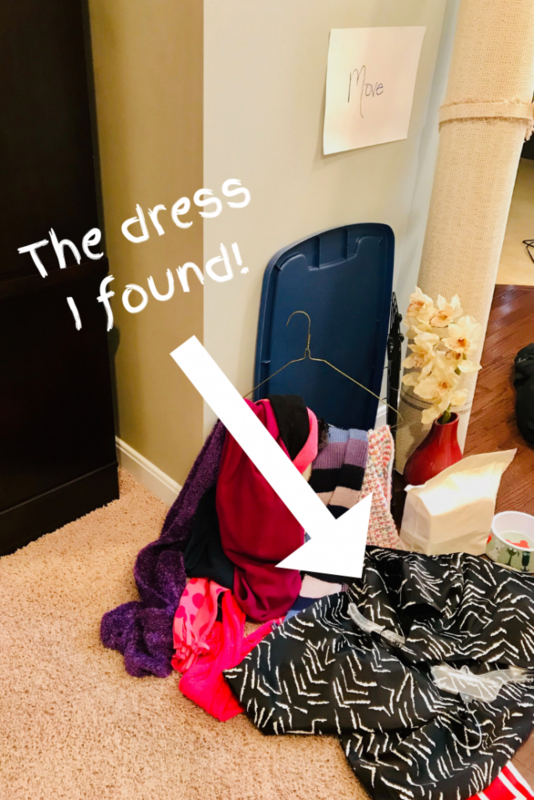 I can tell you from experience, that when you do get back to it, you will be drained and frustrated from having that clutter everywhere for so long. So let’s dive a little further into the “Purge” process. That way you will know exactly how to purge with purpose so you don’t get overwhelmed. Decide which area to declutter. Make it a small area. Even if you want to declutter a whole room, pick just a corner or one small area that you know you can get done in 20 minutes or less. I want this whole closet organized, but I only did half of it the day I decided to organize because of how much stuff was in it. I didn’t want anything to be left out in the open at the end of my organization period! Especially since this closet is right near my front door. You don’t need anything fancy. Just some notebook paper, a marker to write with, and some tape to stick each sign to your wall. Place a large bag or box where each pile will be. 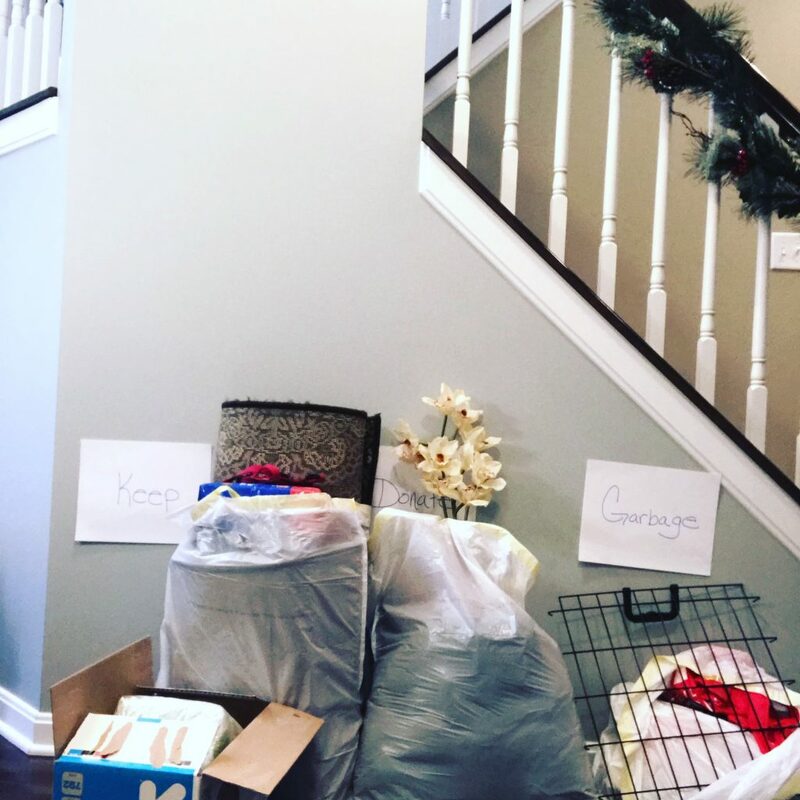 One bag/box per pile so you have a specific spot to place all of the clutter you are cleaning out. Once you have everything removed from the closet, you will have your mess divided into your categories. Then you can immediately take the next action. Take the garbage bag to the garbage. Move the donate bag where ever you keep your donations until you take them to the donation center. You should only have your “keep” and “move” piles left. You have already dealt with half of the stuff you cleaned out! SCORE!! You’re already halfway done! Clean the space and replace your keep items in an orderly fashion using bins, hangers, or whatever organizational items you like for the space. In my space, I just hung up what was left and stacked up the games. There was really no need for anything else. PRO TIP: If you don’t need extra organizational systems like bins and shelves, then don’t add them. They will just cost you more money. Many times, all you really need to do is get rid of things. Last but not least. You need to deal with that “move” pile. Again. Do things with purpose. Don’t just shove the stuff from your move pile back in the closet or area you just cleaned out. Go through the items and move them where they should be. 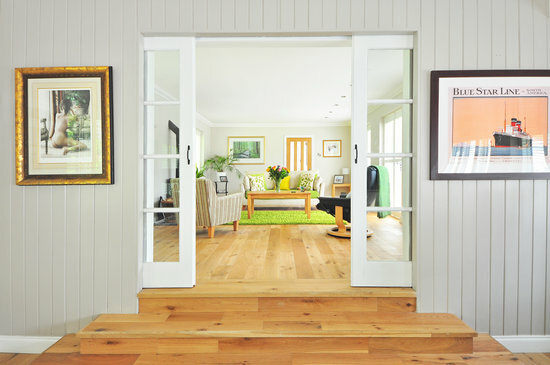 Now your space should be clean and decluttered. And you managed to declutter with purpose in under 20 minutes so you didn’t get overwhelmed. Or… just sit down and watch an episode of Friends on Netflix before the kids get home! That’s what I’m doing!